Below you will find the contents for the July 2014 edition of Website Magazine. The feature article, "Today's Top Web Software" showcases some of the most popular, practical and powerful solutions and platforms for Internet professionals in pursuit of digital success. 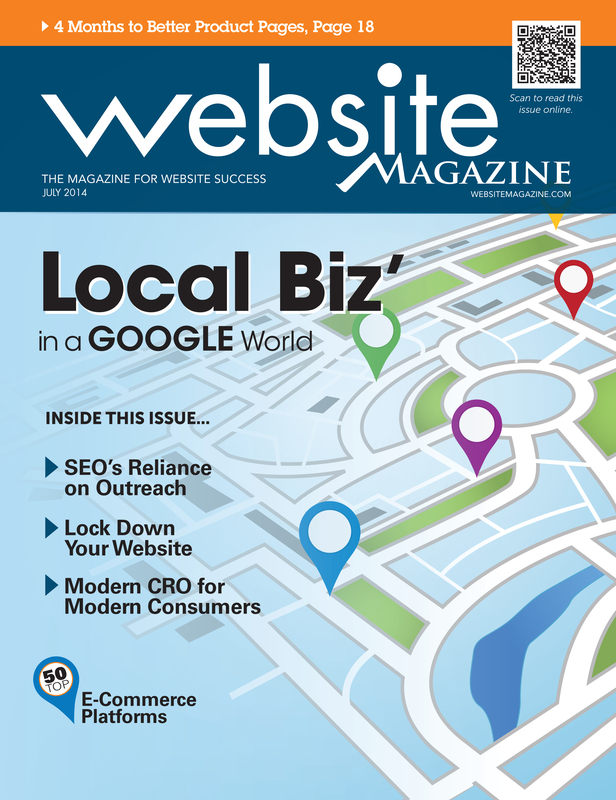 As in each edition of Website Magazine, a wide range of topics (including Search Marketing, Web Design, E-Commerce and more), essential techniques and trends are covered as well. The July 2014 edition is distributed exclusively to our professional-level members (registration required - free). This issue is jam-packed with practical and experience-driven strategies from some of the tech industry’s top minds so take a look at the content below right now and subscribe for full access! It’s a Google world, but local merchants can thrive in it. Google’s diverse offerings include everything needed for merchants to grow their companies both online and off. To be successful, however, local merchants and the marketers who support them must stay up to date on Google’s offerings and know how to leverage them to ensure greater awareness and more ’Net inspired conversions. Consumers’ buying habits are becoming more sophisticated with every click. To increase conversion, brands need to adapt. A user’s experience with recommended content depends on how well organizations use the available technology. “AI” is an advertiser’s best friend, optimizing campaigns to get them to their end goal quicker, while improving ROI. The Problem With "Pin It to Win It"
Brands are telling users to pin to enter their social contests but it’s catching the FTC’s eye – in a not-so-good way. Websites seem to be under constant threat from hackers. And in some cases, the volume of attacks can be overwhelming.